The following emails show the moral lacking of Bhakti Caru Swami and how he dealt with his prospective disciples on certain financial matters. My understanding is that the GBC EC eventually acted on the matter. These emails are from one of the lenders to Bhakti Caru Swami. My name is xxxxxxx and I was given this email address by HH Bir Krishna Maharaj. As you are aware of I have loaned $500,000 to HH Bhakti Charu Swami and his project of McPhar/AMG more than 3 years ago. I had received numerous calls from Maharaj at that time stating how this would help create a much needed financial basis for ISKCON and how this would please Srila Prabhupada. I was reluctant and needless to say scared of loaning so much money to Maharaj especially since my father had to take a lean on his house for that amount. Maharaj had assured me and my father that he would “guarantee” that the money would be paid back on time and be used for appropriately. It was with this assurance (of which I have a copy of this email from 3 years ago) that we proceeded to make the arrangements for the loan. Now it is 3 years later and our situation has become dire since Maharaj and McPhar have done everything they can to avert paying devotees such as myself the due amount and never called or emailed to explain why. Rather they have “turned their phones off”. However, the banks in USA are on my father’s back to get the money paid back. They have been threatening to take over the possesion of my father’s home to reliquenish the outstanding loan. I have been trying to help by working 80 hours a week to just pay the intereest on the loan but the bank now wants principal also paid. I don’t know what to do but it makes me saddened to know that Maharaj would use his $4million dollar land in Ujjain as a bank guarantee (of which i have papers for also) to get money for McPhar/AMG. Why didn’t he use that money to pay back the devotees who gave so unselfishly to Maharaj so long ago. I haven’t received one phone call from Maharaj saying sorry or anything of such sort. WE are suffering while Maharaj and others continue on their “preaching” mission. 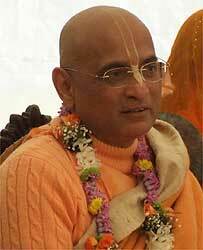 Is this the character that ISKCON is trying to instill in its neophyte members. I used to chant 16 rounds and try my hardest to give that favorable impression of ISKCON to my parents and newly married wife. But this has severly hampered if not severed the relationship they have with ISKCON. I implore the members of the GBC EC to have Maharaj pay my father back the money we desperatley need to pay back the bank. WE want to get our lives back in order and I want my spirtual life back on track. If that doesn’t happen in the near month or so, my father will have to go ahead with his legal team to retrieve his money. That would involve the suit against ISKCON since Bhakti Charu Maharaj is a high ranking member of GBC and he represents ISKCON in his dealings. Also, our lawyers would need the records of Maharaj’s contributions to ISKCON, including the $400,000 donation last year or year before to the Turley case (in reference to where that money came from). I am desperatly trying not to go that route but we need justice and now. We have been hearing too much rhetoric and we need something done. Sudipto and Maharaj may promise you that they will make payments monthly to us next month but I assure you that we have heard that the last 2 years and have received one or two payments. WE can’t continue that way and our banks don’t allow us that freedom of foolish rhetoric. I never imagined this to happen to me since I always spoke so highly of ISKCON and its members. I would have loved to donate to the building of Srila Prabhupada’s dream temple in Mayapur but instead am fighting to get money back. How unfortunate. I hope Maharaj you are doing better; i had been reading your health updates and have come to know that your angiogram was performed and no blockages were found so no angioplasty was undertaken. So that is good news. It must be all the stress you are facing that is causing you so much anxiety and pains. But I don’t understand why you don’t solve this once and for all. You have that property in Ujjain and could have used it as collateral for paying backk all the devotees you called again and again to try to persuade to make loans to MCPhar and yourself for this company. Now when we are all in distress, both financially and spirtually, we look up to you to help us. But what happened, You never even bothered to call again and tell us what happened. Instead, this has become a headache and you want nothing to do with this anymore. Well, its not that simple maharaj. You got us iinto this mess and I think its tiime you accepted responsibility for this and pay back all the devotees. I have spoken to XXXXX and he has also told me his situation. WE are all struggling for what? Instead of signing off on a loan from BOI to AMG, you could have sold the land and paid the devotees. I read from your istagosthi that devotees donate almost hundred thousand dollars for your projects but I know wonder what projects are these that you are funding. I feel ashamed that I am thinking like this but You have left me and others “high and dry”. I have lost lots of faith in ISKCON and its leadership. This situation is now with EC and its been over 3 weeks at least and no response from them. How can this society grow when its not willing to take hard steps to recitify its mistakes and take care of its members. My father’s lawyers are just sitting waiting for my father to give the signal to go ahead with a lawsuit. It is I who have been able to stall them so long but I don’t think I have any choice.